Meanwhile, in 10-inch nonstick skillet, melt butter over medium heat. Add apple pieces; cook 4 to 7 minutes, stirring occasionally, until crisp-tender. Remove; cover and keep warm. Increase heat to medium-high. In same skillet, crumble sausage; cook 4 to 6 minutes, stirring frequently, until no longer pink. Add 1 tablespoon of the flour, stirring constantly, until brown. Stir in remaining flour. Stir in milk with wire whisk. Cook about 3 minutes, stirring constantly, until mixture thickens. Stir in apple pieces, onion salt and peppers. Split warm biscuits; place on 4 serving plates. 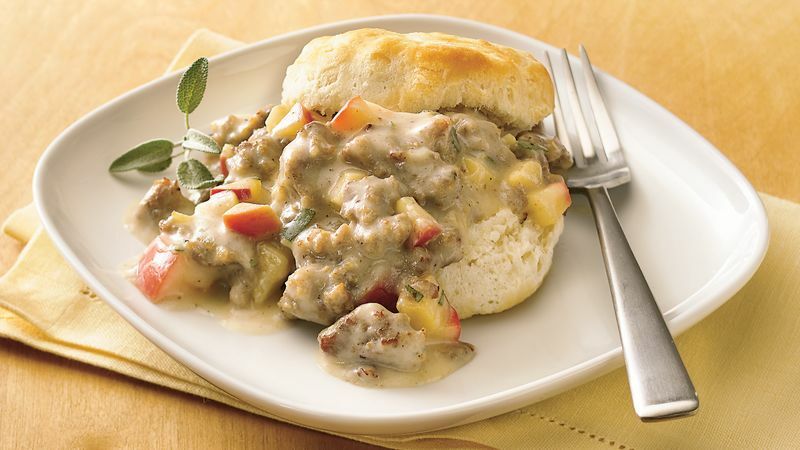 Top with sausage-apple gravy. If you have fresh sage leaves, add 1 teaspoon finely chopped fresh leaves to the gravy.